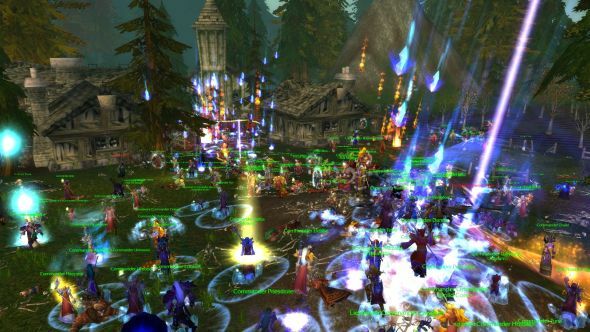 People have wanted legacy servers for World of Warcraft for as long as the game has been patched, and the story of how intrepid players have attempted to make such throwback servers a reality is already a messy one. Nostalrius had been running for some time before Blizzard shut them down, but the team went on to transfer their work to another group called the Elysium Project before suddenly changing heart and asking everybody to please stop infringing copyright until Blizzard make official legacy servers. Now things are getting much, much messier. Check out details on the latest official WoW update. An announcement came today revealing that the Elysium Project will be dissolved alongside allegations that core team members have been engaging in deceitful practices related to project funding. Members of the team doing the accusing plan to reform around a new version of the project called Lights Hope. The PayPal account used to fund the server operation was said to be in the hands of a single member of the team, used under an individual’s name to avoid shut downs from legal requests. Allegedly, one team member has taken over €2,000 from that account for personal financial reasons. Additionally, it’s alleged that this team member was complicit in a gold selling operation being run by another member of the core group. Covering up this operation has apparently led to the support team being unable to set up a log management server and generally do those things you need to do to properly run an MMO. The Project Elysium servers are currently down, as the team believe user data may be at risk of being sold to third parties and have completely wiped the servers accessible by the accused members of the group. Lights Hope will relaunch on backup data from those servers made just before the shutdown and wipe. All these allegations are especially strange to parse because the entirety of Nostalrius, the Elysium Project, and Lights Hope are based on Blizzard’s IP and proprietary data, making the whole thing illegal from top to bottom even before money gets involved. While it’s not surprising that the community has stepped in to fill that desire for legacy servers, it’s similarly unsurprising that the situation has devolved into such a mess over time.